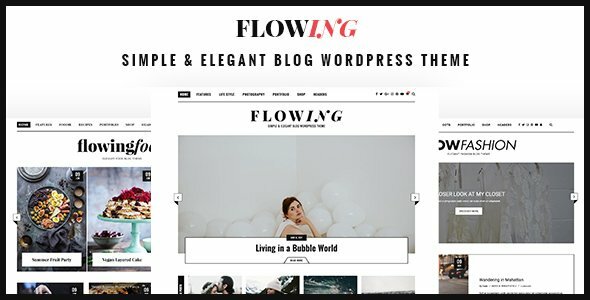 Flowing is a WordPress Theme crafted with bloggers/newser in mind, impress your audience with bold, clean, and stately aesthetic. From its stunning slider and promo boxes to the plethora of color options, Flowing delights visually and functionally, giving you the power to customize your blog with just a click of the mouse. With lazyload images included, Flowing is light & fast. And if Flowing numerous features, robust options, and arresting design weren’t enough, rest assured knowing that your theme is backed by PenciDesign’s acclaimed customer service. Images used on the demos site are all from Pixabay. Those images are not included in the download package. * FIXED: Related Posts slider doesn't work fine on tablet.